I’m really excited about this project for two reasons. 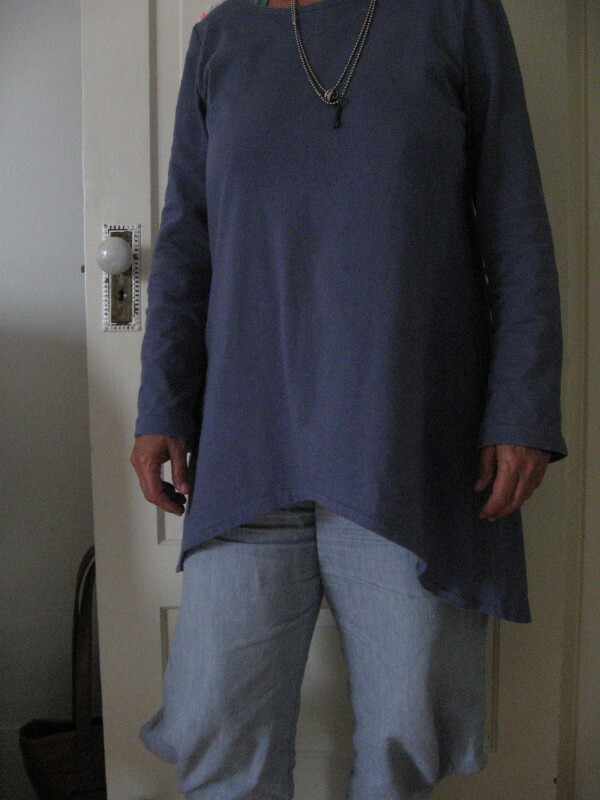 First, it’s the first item I’ve made from the fabric given to me at my recent fabric party. Yea! One down, 14 to go :p~~. And second, this vest is the product of a series of lucky? fated? unplanned for sure events. I would never have made this vest under normal circum-stances. I wouldn’t have bought this particular fabric, even though I like it. I wouldn’t have planned this combination of pattern and fabric. Believe me, my finger was barely touching the rudder of this boat. So you’re wondering how it got made? I guess my primary contribution was to buy the pattern, which happened before I received the fabric. It’s actually a jacket pattern, another Marcy Tilton, which you will be happy to hear I didn’t pay full price for. It’s one of those ‘barely there’ patterns: three pieces, and only a couple of instructions. Basically, sew fronts to back, sew sleeves to body. That’s it. Who wants to pay for that? Oh yea, it includes instructions for felting some wool string onto the body if you want. I bought it because I liked the design and thought it would make great indoor sweater/jacket sort of things — loose and non-binding. None of the edges are finished, so it’s meant to be made up in fleece-like fabrics, or maybe a worsted woolen if you want to do the felting. When I got this “web” kind of fabric — it really can’t make up its mind whether it’s stripes, diagonals, circles, squares or diamonds — I thought it would work because it’s double-sided; since the fronts of the jacket just flap open and don’t have facings, the inside of the fabric has to be of the same quality and appearance as the outside. There wasn’t enough fabric to make sleeves, but I’m okay with vests. They’re great for layering in the chilly “wet-coast” rainforest and they don’t bind the arms and shoulders. So I started cutting it out, wondering at the back of my mind how I was going to finish the edges. 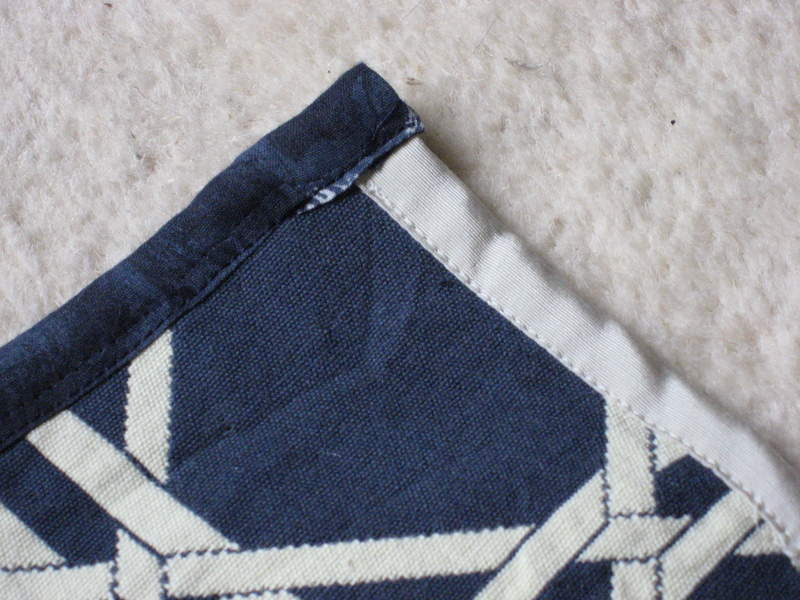 There are only four seams, and since either side of the fabric can be on the outside, I decided to make it reversible by folding under the selvage edges and topstitching them. I’m a really slow sewist, so all this took about a week, during which time I kept the question about how to finish the raw edges simmering on some burner way at the back of my mind. (You can tell I’d never worked with seam binding, can’t you?) Normally I wouldn’t dream of starting a project until I had figured out all the techniques that would be required, so I was just floating (to maintain the imagery) on a boat of belief that the necessary knowledge would come when required. Eventually and slowly the idea of making seam-binding sort of coalesced until I went digging through my stash of left-over bits of fabric looking for something I could use. I found two things — an old black and blue floral skirt and a length of shimmery beige fabric that I actually bought to make some ruffles. I couldn’t make up my mind, and then I knew (really!) that this fabric could be bound with two different kinds of bindings. The fabric really is a web of upright lines, diagonals, circles and squares. It’s so …busy that two kinds of binding doesn’t add any more busyness to it. So here’s the final view: the reverse side and hanging loose. I think it’s a marriage of form and content that’s pretty cool. Couldn’t ‘a planned it better. 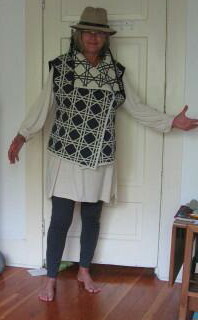 And by the way, calling it a “web” vest is only partly because of the fabric. 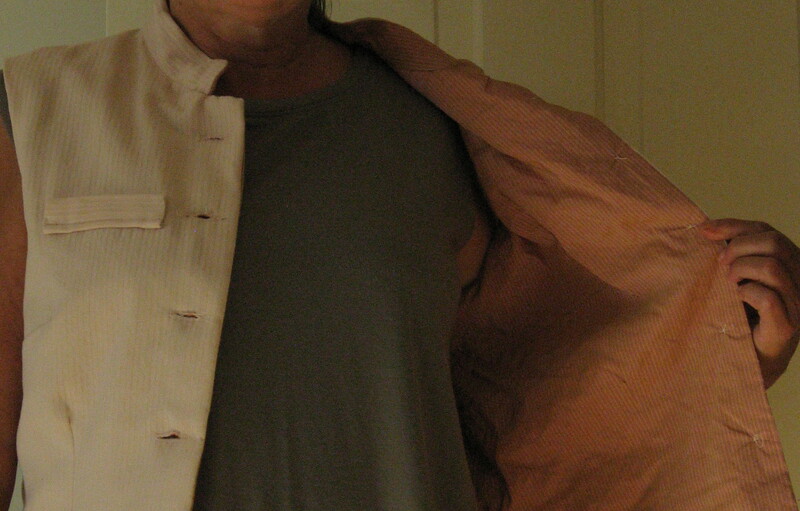 I’m also honouring, in a tongue-in-cheek way, the man who gave me the fabric. Thanks doctor Webb 🙂 Do you like it? Last week I hosted a special event, an “exit” party celebrating the end of my career as a college English teacher. I’m not a big partier and hadn’t hosted a party for a few years, so I was thinking a lot about how to make it fun for the ex-colleagues I was inviting. I was also thinking about how to avoid being presented with a variety of small gifts that I’d likely have no use for. Then I had a sudden inspiration for how to achieve those two goals — I could ask people to show up with a metre of fabric. And I could tell them that in exchange I would blog about what I did with their fabric in my new sewing blog. I imposed a pretty low maximum dollar figure, told them the fabric could be new or used and waited for responses. I’m happy to say that the invitees thought it was a good idea and even the men took on the challenge with good humour. 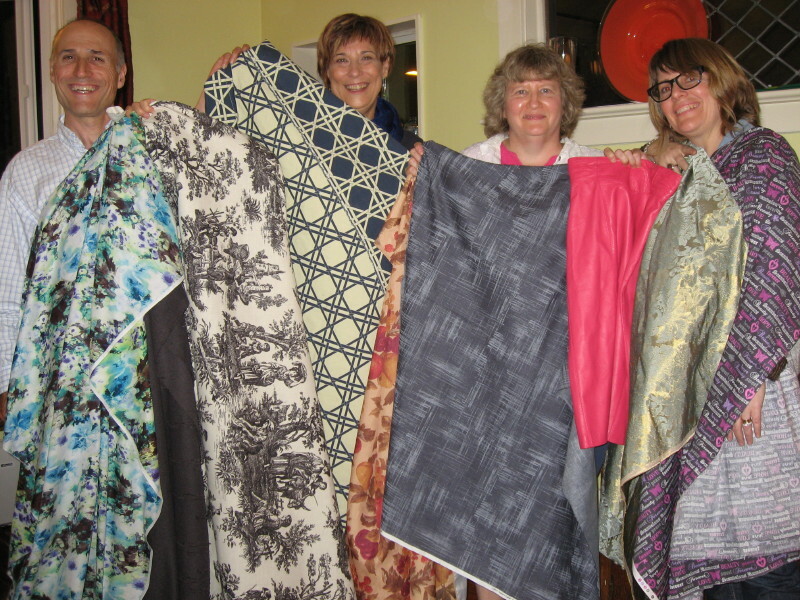 Those are some of my colleagues, with some of the fabric offerings. But I’m feeling kind of overwhelmed now. I like all the fabric, and I now have about 15 new projects that I’m “contracted” (in a manner of speaking) to sew and then to blog about. How about that, eh? Has anyone else tried this sort of party? I’m wondering what other people’s experiences with this kind of event might have been? I don’t like to buy a new pattern for every project. I kinda think that’s for kids, you know? At a certain point, even an amateur ought to be able to start altering patterns to produce a handful of different pieces from one base pattern. But I browse pattern books looking for ideas. Which is how I came across Vogue’s Marci Tilton patterns. I’m in love! I haven’t yet seen one of her designs that I haven’t fallen hard for and what to do? Those Vogue patterns are expensive. I popped for one of them, though. It’s V8499, loose trousers and a skirt. I thought I’d have to buy fabric, but I pulled out something I’d picked up a few months earlier from Value Village. It’s a fabric that’s hard to decipher. 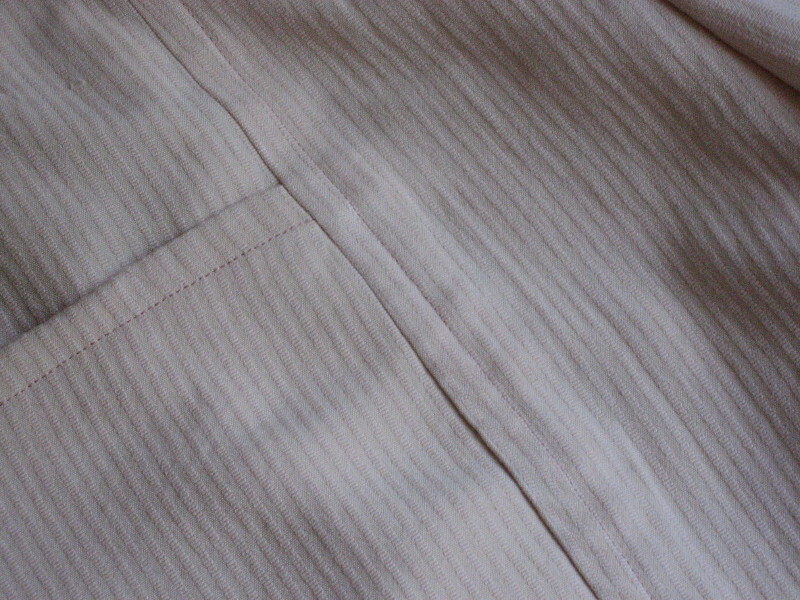 Pale peach — not really my best colour — but at nine yards for about $20 I thought I could make curtains with it if nothing else. I set fire to it, naturally, as soon as I got it home, to see what it might be made of. The little clipping flamed high and turned to ash in too short a time for me to catch a whiff to determine exactly what kind of natural fibre it was. I think it’s silk, or a silk blend. It’s heavily textured, which made it seem kind of stiff. Even after washing, it seemed pretty stiff until I draped it over my hand, at which point it showed a lovely flowing drapiness. It’s an odd fabric that appears heavy or light depending on whether it’s lying flat or hanging. 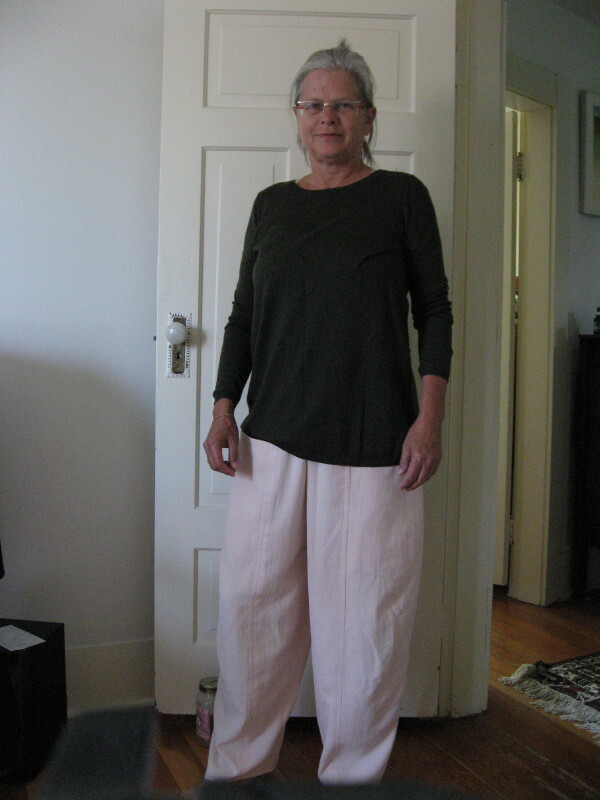 Eventually I decided it would probably drape in the right way for loose pants. The pants are made of eight panels, four per leg, and they’re all topstiched. I decided I’d better get the size right since I wouldn’t want to have to alter the fit after the fact, not with eight top-stitched panels. So this project turned out to be a great exercise in care and meticulous preparation. I actually made a muslin (well, half of one, just one leg ). I spent a lot of time. Since Vogue apparently thinks women have hourglass figures, I had to redraw the curve from hip to waist to match my more boyish shape. Then I used the muslin leg to figure out which size I needed. I used my measuring tape! Repeatedly! 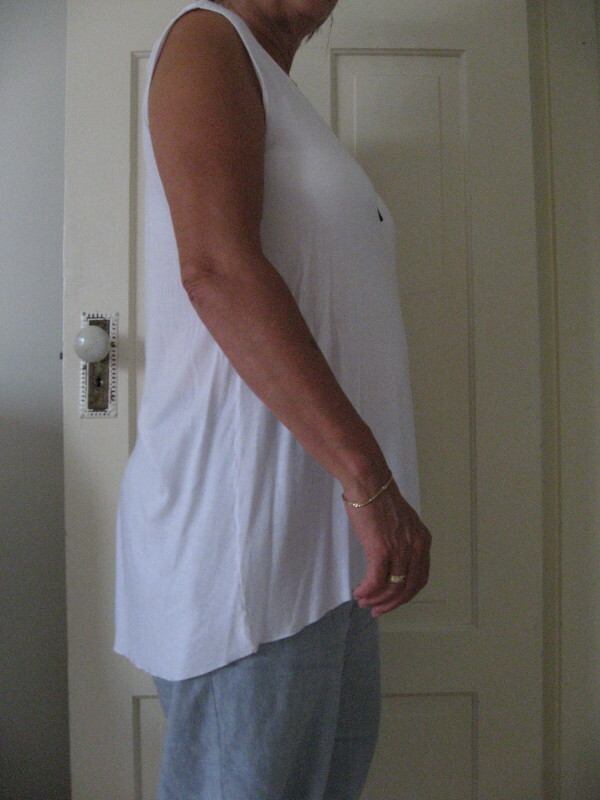 I smoothed the muslin leg across my waist and hips, measured it and me, and was certain I had it right. So I don’t quite know how I managed to fail. 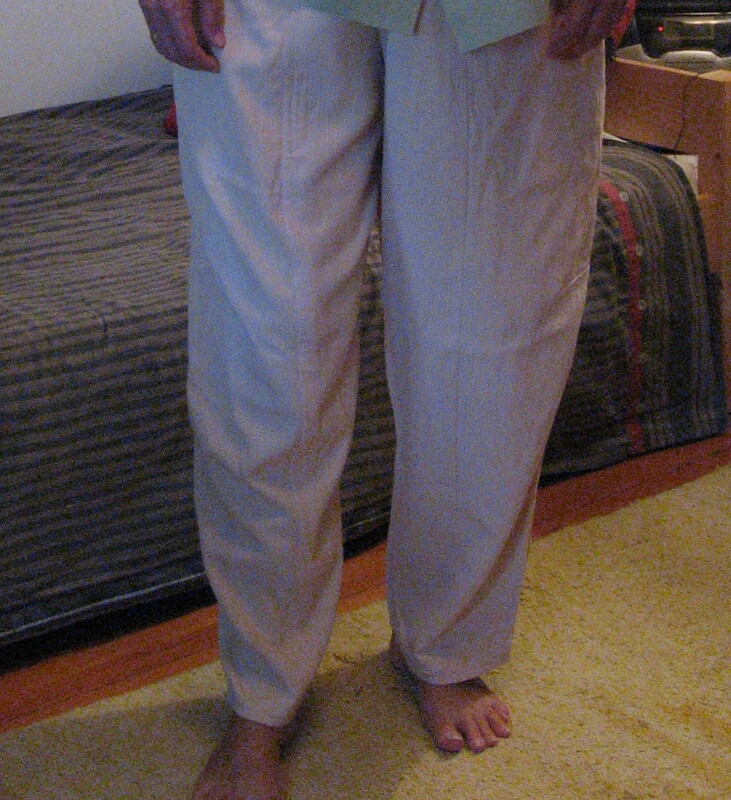 I didn’t really know how these baggy pants were supposed to fit. I knew they had to be able to fall over the widest part of my hips/thighs, but I didn’t really know just how much ease they needed, and the Vogue pictures are too dark and muddy to help enough. Halfway through the project I was getting concerned because the pants looked huge. But the measurements for the front were correct, and the back was going to get elastic in the waist, which meant I couldn’t try them on for an accurate read until they were done. 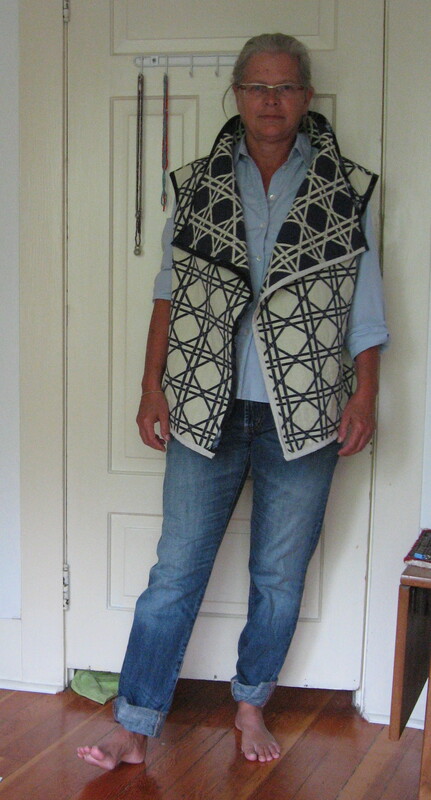 I made a matching vest using a pattern I made by patching together a couple of shirt patterns and a funky long vest pattern. Then I researched online for how to line a vest. I had a really nice stripped, stiff cotton fabric that I wanted to use. But I’m not terribly happy with the vest either. I think I should have interfaced it. And I’m not really sure it’s okay to have a lining fabric that’s stiffer than the outer fabric. Since these pix were taken, I’ve somewhat altered the pants. I took in the inseam by about half an inch to reduce the width of the legs, and I took in the centre seam, particularly in the back. They’re perhaps still not perfect, but they’re a lot better. I can enjoy wearing them now. And I’ve got a darker fabric ready to make a second pair in a smaller size. Then we’ll see if Marcie Tilton loves me back. I like praise. Sometimes I wonder if I’m the only person in my neighbourhood who does, given that nobody I know ever gives any evidence of wanting any. I know all kinds of people of accomplishment, and they rarely broadcast their successes. I, on the other hand, am tempted on every minor accomplishment to do that little dance male football players do when they’ve carried a ball across some goal line. That running on the spot thing, throwing fists in the air, yelling “yesssssssssssss”! Whenever I’ve even begun some pale and tepid imitation of that, people have looked sideways at me and I know they’re thinking I’m weird. Singing the alto line note-perfect one Sunday morning in the church choir? “Yesssssssssssssssss”! Oops. Ahem. The other choristers glance at me and away again quickly. When I first took up sewing again a few years ago, some friends complimented me on something I was wearing, asked if I’d made it, expressed admiration over the accomplishment, but after the first or second time, that was it. How much glory do I want? Last week I was reading a novel, Still Life, by the British author A.S. Byatt, in which the narrator was contemplating exactly that thing. She had a mother and brother who were passive and virtually helpless, but a younger sister who had just received scholarship offers from both Cambridge and Oxford and was crowing about it — quite legitimately in my opinion, and in the narrator’s opinion too. Call me Frederica I guess. A Frederica who hasn’t learned. I sewed this cape as part of a costume for an opera role I was about to sing with the amateur opera company I sang with for a few years. When I showed up wearing it at dress rehearsal, I was met with more than enough admiration. It was great. And I know the reason was that my costume was going to help everyone else look good. We all admired and congratulated each other that evening because we knew the production as a whole would please audiences more because of all of our individual efforts. As a group we could all share in the glory, and there was plenty to go around. But that was then, and this is now. I haven’t had any occasion to wear this cape since then, and I don’t see any occasion coming up. Where does one wear a gold-lined blue velvet cape, except on a stage? What do you do with clothes in your closet you’ve laboured over for one special occasion? It’s inconceivable to me to sell it or give it away. I guess I can pull it out every once in a while and enjoy the feel of it. It’s a real beauty, isn’t it? Isn’t it? One reason I stopped sewing years ago and didn’t take it up again until recently was that I couldn’t find fabrics I liked. There were very few fabric stores in Vancouver and they seemed to have a lot of cheap human-made fabrics in patterns and designs that didn’t match my idea of “woman” — way too “feminine” for me (we must have a talk about that label :)) Shiny floral polyester? Mmmm, not for me, no thanks. Now that I am sewing, the one thing that tempts me to ready-made clothing is the fabric. And I’m still disappointed that the fabrics of these ready-made items are not available in local stores, although I suspect I’m finding some of that in the bits and ends bins at Dressew Fabrics and thrift shops. I probably use home decor fabric more often than I use dress fabric — and I feel better about that since I read that that was perfectly acceptable in a sewing magazine I was browsing at my local library. Not that I need a voice of authority telling me what’s acceptable, or anything. The article did suggest washing home decor fabric first to eliminate any finish put on it for home use. Last week I dropped in at a newish clothing store on trendy Main Street in East Van to have a second chat with the owner, a Scots transplant named Isabelle Dunlop. I’d enjoyed a previous chat a month or so earlier so much that I thought I’d see if a repeat was available. (Also I really like some of her clothes and was looking for items I might like to, not copy exactly, but get ideas and inspiration from). This time, after a few brief introductory comments, I confessed that I made all my own clothing, leaving her to infer that I wouldn’t be buying any of her’s. She was delighted and we settled into a sewing conversation. I was telling her about my disappointment with the lack of interesting, quality fabric when I spotted a merino wool sleeveless shell hanging on her rack. “Where did you get that fabric?” I demanded. Sort of. It was more an exclamation of disbelief. I didn’t really expect her to reveal any of her supply secrets, but she told me she’d gotten it at an East Indian fabric and sari store further down the street among the curry houses, panwallas and vegetable shops. So I went on my own scouting mission to Roko’s and I did indeed see a couple of rolls. I managed to buy a leftover end for a discount of what already surely is a reasonable $20/yard. I’ve left the armholes unfinished because when they get in a new supply next month, I may go back for more and make sleeves. I’m definitely going to pick up one or two other colours. 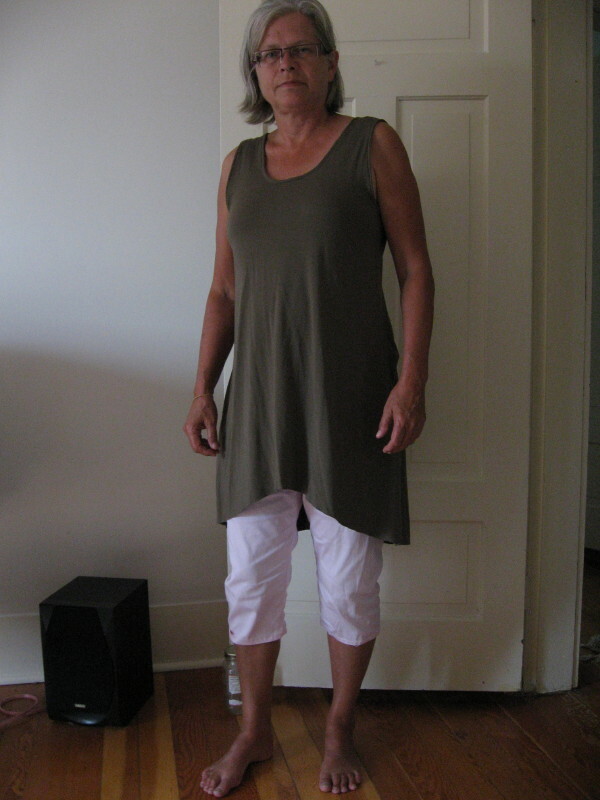 I also made the top in a drapey white modal which I picked up at Roko’s at the same time. I finished the armholes, but don’t want to hem the bottom because I know it will inhibit the drape and flow of the fabric. 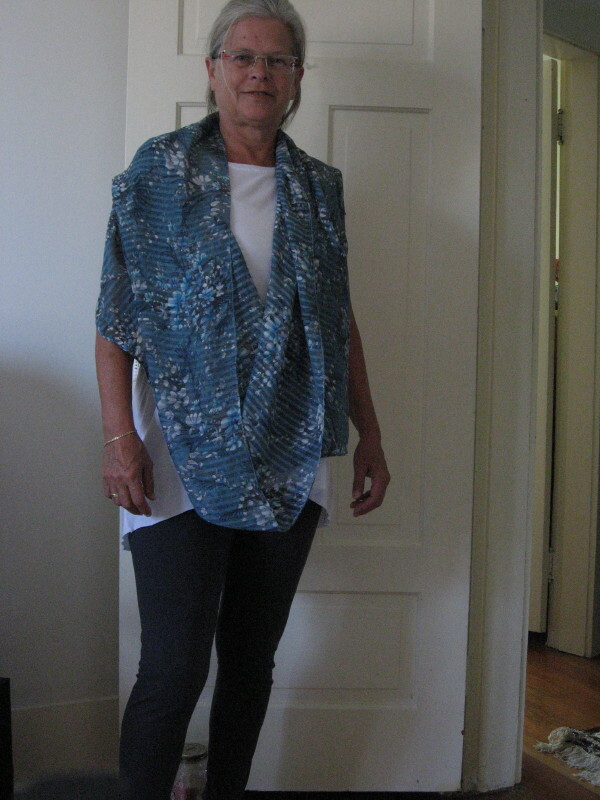 I modified an older see and sew pattern B5203 for this top. 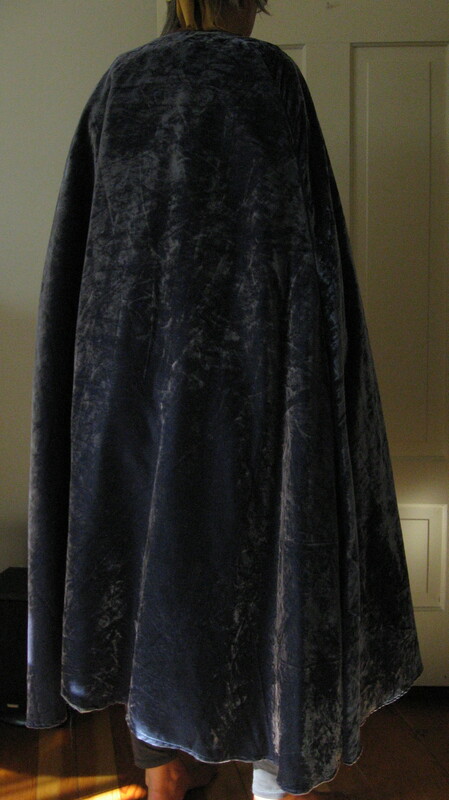 In the original the hemline is shorter at the front and back, and longer at the sides. I’ve made it in long sleeved and tank versions, longer and shorter. 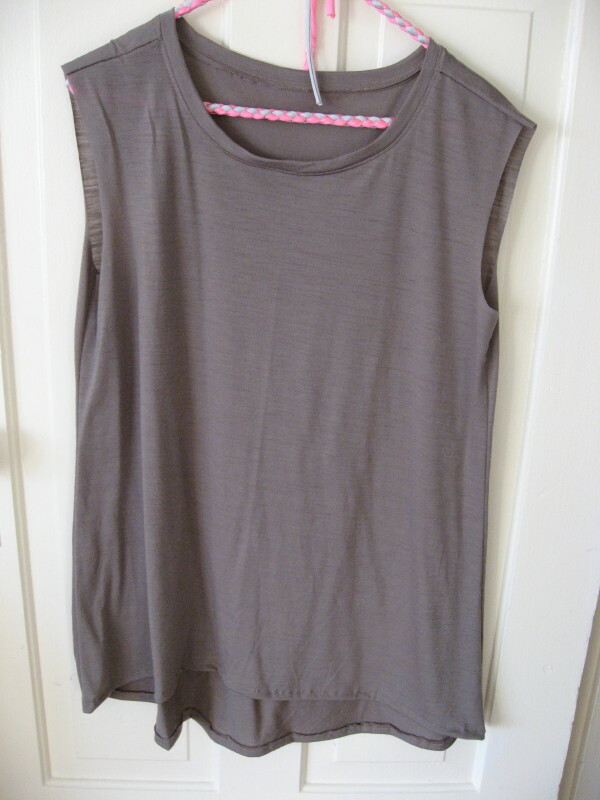 I really like this as a base pattern because it’s loose and comfortable, has a good fit and a nice neckline. Here are the longer versions.